Ever since I was young, like many people, I have had a great affinity for artwork. As a child, I drew everything I could think of – from scenery (I really liked mountainscapes) to animals like horses and dragons. Fantasy drawings mixed freely with reality. As I grew older, my eyesight unfortunately started to slowly fail, and I drew by hand less and less. Eventually, I discovered painting models, and with a lamp fixed with a magnifying glass, I jumped into 3-D artwork, and loved it. I continued to paint models for years, up until my home burned down in 2012, along with everything within it. With that, my painting days pretty much ended. However, my love for artwork didn’t go anywhere. Though I mourned my own, now lost, I turned to other artists and began to collect pieces I really liked. From paintings to figurines, I covered my walls and desktop with new art, and felt better. I have always greatly appreciated having nice things to look at – perhaps because I know at some point I may not be able to look at beautiful things at all. Perhaps too, that is why I can find beauty in almost everything, even if it is something that may not be to my taste, or fully understood. I still desired to create my own work, but as my workload continued to increase and my eyesight decreased, the opportunities to create came fewer and fewer. Even my writing began to suffer, as novels and ideas sat for long months untouched. I felt a great deal of sadness over what I perceived was a loss of my creativity, my motivation. It took me entirely too long to realize I was still creating art. It just wasn’t hanging on my wall or collecting dust on my shelf – it was running around in the fields. From the very beginning, I have aimed to produce beautiful goats. I want bright colors and gleaming eyes, with spotted coats and trim little ears. I want sleek long bodies, graceful legs, delicate faces. I want round soft udders tightly attached high between the back legs, and sharp little hooves to carry them. I want living artwork. Any breeder with an end goal in mind is creating their own artwork. When the show goat breeder poses her new champion doe, that is the result of years of planning and work, come to literal life. When the hunting horse stretches over the jump with his rider clinging to him, the breeder can see her own results flying without wings. When the labrador swims back to his owner, the limp duck in his jaws handed over without a feather ruffled, he is doing justice to every moment spent in his creation. And yes – even when the farmer carefully wraps the perfect cuts from what was once a little piglet pulled wriggling from his mother, he has created and brought to (near) completion his own form of art. We are artists together. A living being is our canvas, the genetics our paints and oils. The care we give them are the strokes made upon the backing, and the result reflects every morning and evening spent with our stock. Branching into (very amateur) personal photography only broadened my appreciation for my little goats. Though little can compare to watching the actual animal in the flesh, often their lives come and go so quickly compared to ours. When their spirit is captured in a photograph, it lives forever. It can be shared across the world, as artwork is meant to be. So though I may no longer have the eyesight to draw, or the patience to paint, nor the time to write, I continue to create. I can run my fingers through the soft damp fur of a brand new creation many times a year. I can watch them grow, and in turn, become what’s needed to create the next year’s success. I can send them to new homes and see them upon a new backdrop, bringing brightness to a friend’s life. Anyone who has kept goats can tell you some years are harder than others. The year we had an outbreak of toxoplasmosis reigns supreme as the worst year in goats I’ve ever experienced, and I hope that nothing ever comes even close to how difficult it was to deal with. It started out in late autumn – a doe aborted. With a herd this size, that’s generally not an unusual occurrence. Does can slip their pregnancies for a number of reasons, and I tend to expect at least a couple a year. She wasn’t the only one to abort though – several others did as well, but they were weeks apart and we decided on a round of antibiotics to clear up any potential issues. That seemed to put an end to the issue, but it was really just beginning. With kidding season less than a month away, another doe aborted her twins in the field. Two does kidded a couple weeks early, and all of the kids were born weak and small, and soon died. One thing that I noticed was that the afterbirth smelled absolutely horrible. A rank rotten smell that filled the air around it. Obviously by now I was incredibly concerned, and we sent off blood to start looking for a reason. I sent a warning to our volunteer barn watchers, concerned that this could possibly be a zoonotic issue, and I cannot put anyone at risk. 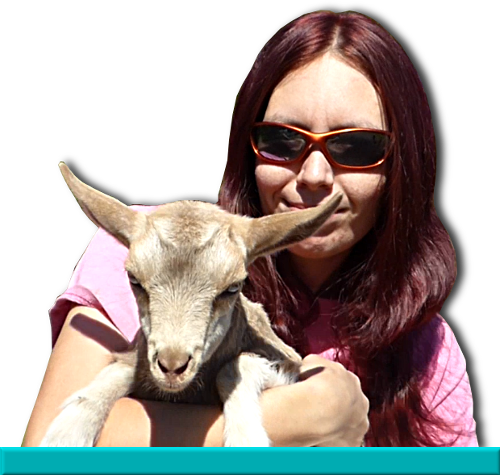 We were able to rule out the big-bad diseases every goat keeper lives in fear of, including Q-fever and Johnes, fairly quickly, which was a relief at the time. At this point I assumed our issue was chlamydiosis, and we decided on another round of antibiotics for all the does and kids. More does kidded, and more weak kids were born. The entire farm spent several days and nights pulling all the stops to save them, to no avail. Finally after testing of dead kids, a set of fetuses, and blood-work, we had our answer: Toxoplasmosis. Not a virus or bacterial infection at all – a common parasite than can infect many species, and reproduces in cats. Cats! We do have cats, but they are almost always indoor and the goats had been exposed to these cats for their lifetime. We’d not added any new cats, and no feral cats are ever in our barn, thanks to the farm dogs. It turned out that the cause of contamination had been a hay shipment – round bales kept in a barn that obviously must have had barn or feral cats within. The infected birthings were obvious – it affected mostly the Nigerian Dwarf, though many of the La Mancha were also infected. The babies were born dead in varying stages of decomposition, or very weak. Some babies would appear normal at first, but quickly decline and die within one to two days. The placenta and amniotic sacks had a terrible smell and were sometimes decomposed themselves. Particularly interesting were many placenta that had quarter sized red lesions upon them. Most of the does showed no signs of illness, even with infected births, but several did become ill, and one young La Mancha doe died shortly after giving birth to weak kids and an afterbirth that smelled like death. Just a couple weeks into kidding season and I was totally trashed – running day and night doing what I could to save any kid I could. So many kids died as we held them, and I felt every loss very deeply. Added to the horror of the situation was the fact that many – most – of the kids who died were sired by a very promising young buck that had died young. These were his only kids, and every one that died remains in my memory to this day. To make matters even worse, my best friend from across the country visited for the first time ever, only to find me in zombie mode surrounded by death and devastation. The entire farm had a sad grey pallor over it, and I remember that the weather matched – long days of dreary rain and thick mud. Some of the does would cry piteously after their kids died and were taken away; I’ll never forget Catnip’s confused cries as I milked her out the day after her first kids, a beautiful set of triplets, died shortly after being born. Not all of the kids from infected birthings died right away, but many were terribly effected. Blindness was very common, as well as failure to thrive. One little black buckling lived for almost two months, and never gained more than a couple pounds. He had only partial sight, and would run along the walls of the kidding pen if he heard me. Other blind ones would just run into corners and wail non-stop, even injuring their faces as they bounced off the walls. Stargazing was common, and some could not stand or walk. There was also several cases of contracted tendons, the worst I’d ever seen. Only three obviously infected kids survived longer than three months. The first was a little Nigerian doeling, born alongside two rotted siblings. The second Nigerian doeling lived when her two siblings died and after a short time, flourished. The final was a Mini Mancha that developed a terrible infection in the eyes, but with round the clock in house care, survived, though she lost the majority of her sight. Unfortunately, the first was lost to pneumonia and the second to uterine rupture. The blind goat, Pinky, is doing great and lives a very fulfilling life. She’s the only Toxoplasmosis kid left alive now. The entire event feels very surreal now, but I only need to look at my paper kidding records to be reminded – an orange highlight slashed through each dead kid is chilling, especially as you turn each page and count just how many there were. I regret not taking more videos and pictures, but I was so depressed at the time it didn’t even begin to register in my head. I do have one video showing a kid stargazing that I will post at the end of this blog. At the time, I talked very little about the specifics of what was going on to the online public, and I closed down even more after a couple of people decided to take that information and run with it, spreading rumor. The silver lining is that goats are not good hosts for toxoplasmosis. It affects them for about forty days, and is spread through fluids, most commonly birthing fluids. It causes abortions during early pregnancy, and in latter pregnancies, starves the unborn kids in utero, causing them to be stillborn or weak at birth. Once they’ve acquired it and been affected, does develop some immunity to the parasite. Kids that were born among the chaos but not infected had no troubles at all, and most have grown into lovely young does. We deep cleaned the barn, hauling the dirty bedding out to the back of the property to compost, and precautions were taken between handling goats in labor and birthing. I developed a great dislike for the idea of a barn cat – cats belong inside your home, and I’ll not be budged from the thought. As you can imagine, we were on pins and needles awaiting the following kidding season. I’m happy to report that there were no illness or infections among the kids or births, and it was an all-around successful kidding season. I’ll never forget that horrible season though – if there has ever been a time I seriously considered calling it quits, this was it.